Why Buy Your Shed From Us? Providing the following information will help us configure the best building possible to fit your spot and meet your needs. 4. Are you aware of any restricted easements on your property such as utility easements? 5. Are you aware of your city/county codes for accessory structures related to size, height, set-backs, and lot coverage? 6. Are you aware of any fees your Building Dept. will charge to approve a new ADU on your property other than Building permit fees? Additional fees could include Environmental Fees; Development Impact Fees (School, Park, Traffic, Fire, etc. ); Water, Gas, and Sewer fees? 7. 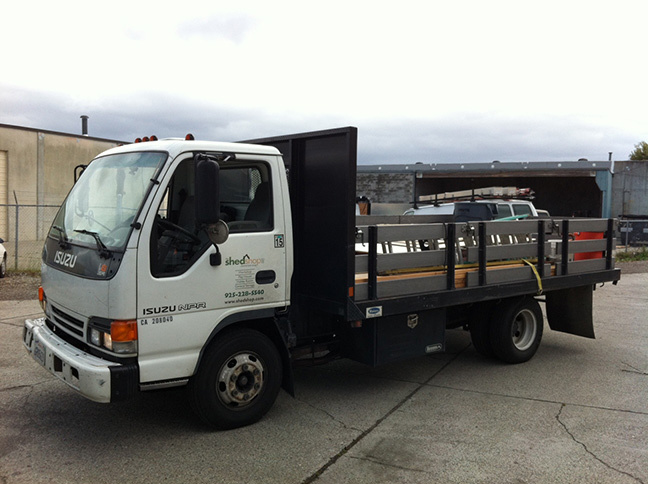 Are there any challenges in accessing the site – delivery truck parking, stairs, distance, slope, narrow pathway, etc.? 8. Is there a reliable 110V power outlet within 100 ft. of the building site for our power tools? 9. Please upload two or more all-encompassing photos of building site, including surrounding area, from different angles. Please measure the total available space of the building site in both directions (for example 13 ft. 6 in. by 18 ft.). Note: we need at least 18 inches of workspace around all sides of the building. I hope you find what you are looking for. Please send me a note with questions or suggestions regarding our site, our sheds, or sheds in general. I would appreciate hearing from you. "Being an art teacher that sees over 300 students a week (in addition to creating my own art), I definitely needed space for art materials." "We are very happy; so is our dog Jasmine."